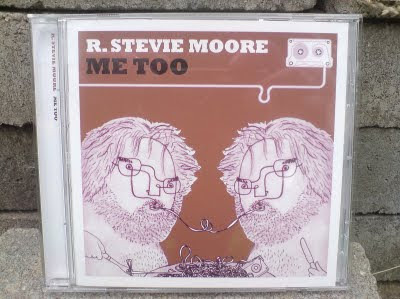 Today I took delivery of the new R. Stevie Moore compilation on Cherry Red, "Me Too". Some few years ago now, Steve Potatoes played me R. Stevie's I Like To Stay Home and I unwittingly took my first dip into the deceptively calm shallows of RSM's bottomless swimming pool. Somewhere along the line since then, the magnetic tape of fate somehow got tangled, and, while God was looking for a biro to wind it back in, I found myself drawing the cover for this new CD. I took inspiration, as always, from Lady & The Tramp (but also R. Stevie). The CD is (typically) very, very good.. uncategorizable.. veering unpredictably between perfect garage pop, weird spoken word and acoustic bliss.. great stuff. I feel really honoured to have my silly drawing on this fantastic album. Check it out people!! You can buy it here, along with the ESSENTIAL Meet The.. compilation! "Let's Rest Together", a heavy-headed jam that features (in fuller form) on the new comp. I dig thine demento-art, the RSM context is just a bonus!